I decided to make a feminine and masculine card using the same exact papers. I had fun doing this project and it was a bit of a challenge for me. if you scroll to the end, you will find step by step instructions for each card. The two sheets of paper were from the FabScraps Wild At Heart collection - Wild Tunes 2 and Wild Ride 2. 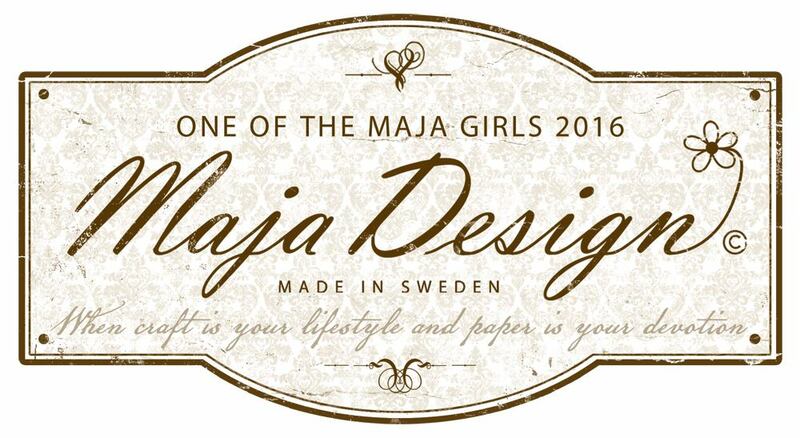 At first glace these papers cater to the masculine side of life. 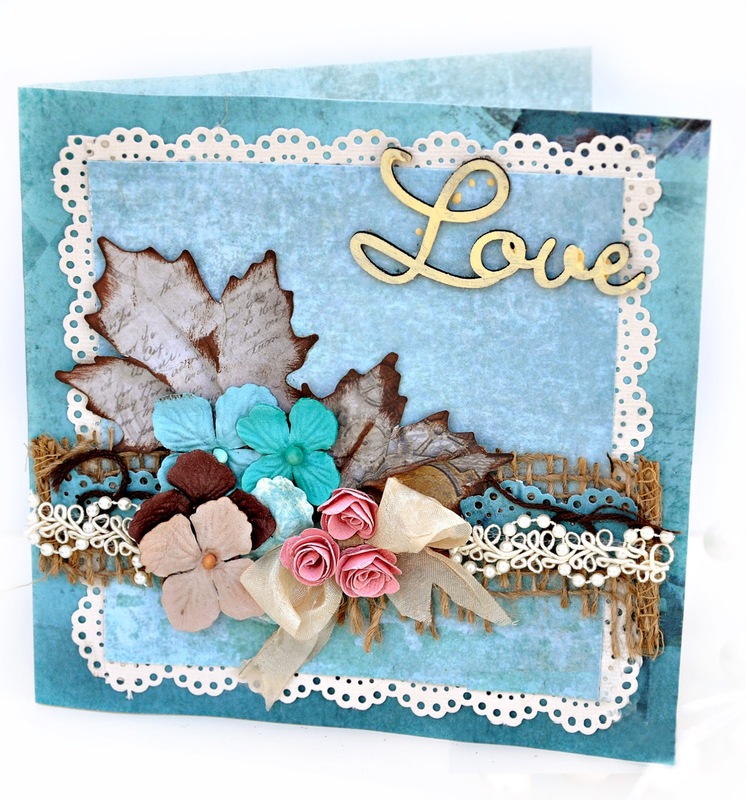 With a little creativity and a boarder punch, its easy to add a delicate feel. The masculine card uses Wild Ride 2 as the base for the card. I coated the Wil;d At Heart chipboard piece with Molten Metal Enamelz from Shimmerz. This is such a cool product. When melted, it looks just like, well, metal. Perfect for a masculine rugged look. I grabbed this little bubblewrap trick from Shona Keehn, She works magic with bubble wrap and I love how rugged it looks so I thought I would try it myself. Thanks Shona. For the feminine card, I reversed the papers and used Wild Tunes 2 as the base of the card. 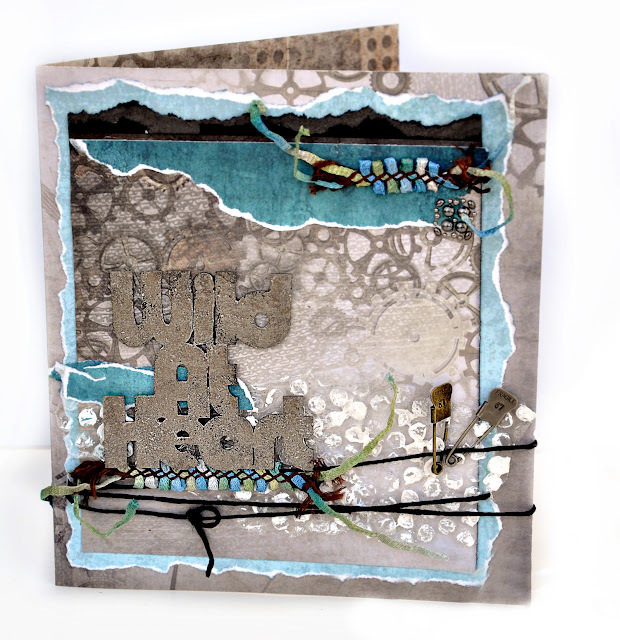 The beautiful blue/teal work well for a feminine card. Add a touch of lace and some pink and it all comes together. The little pink flowers are rolled from paper using Rolled Rose Die die from La La Land. The leaves were punched from EK Success large leaf punch. I crumpled the leaves and then ran an ikn pad over the crumpled edges. Thanks for stopping by. 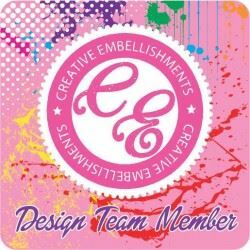 LIKE Fabscraps on FaceBook and visit their blog here. 2. 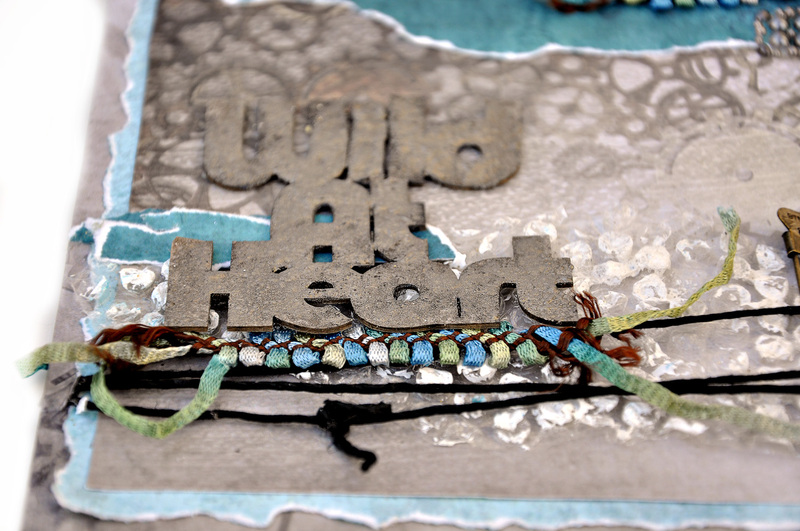 Cut 6in x 12 in strip of FabScraps Wild At Heart Wild Tunes 2 paper C59008 for the base of the card. Fold in the middle. You can have this card open any way you wish. 3. Cut a 4.5in x 4.5in square of Wild Tunes 2 paper to use as the front of the card. 4. Using a decorative edge punch, punch four strips of edges from the cream cardstock and glue to the 4.5 square of Wild Tunes 2 in step 3. You will create a little frame around the square. 5. Glue Square to the card base. 7. Punch or cut two large leaf shapes from Wild At Heart Wild Ride 2 C59006. 8. Crumple/ scrunch the leaves and then run ink pad over the crumpled edges making sure to ink the creases on the crumples. 9. Ink the edges of the leaves. 10. Glue to the card. 12. Glue a piece of burlap 6 in to form a border for the leaves. 13. 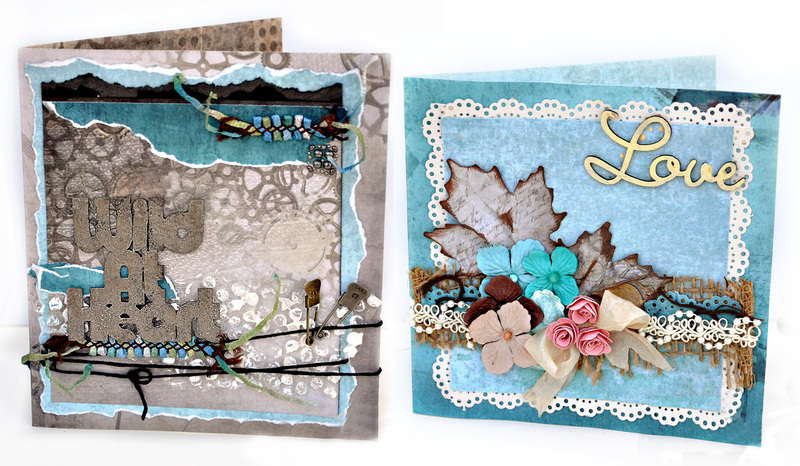 Punch a 6in decorative border strip from Wild At Heart Wild Tunes 2 and glue over the burlap. 14. 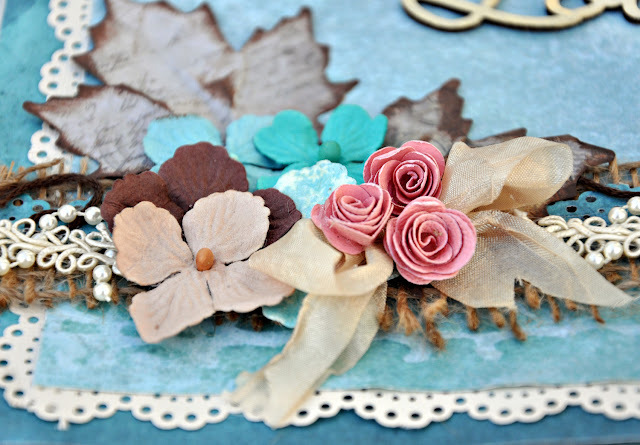 Glue a piece of lace trim over the border punch. 15. Complete with flowers and a ribbon bow. 16. Tuck in brown embroidery floss around the cluster to give some definition. 17. Add appropriate sentiment using chipboard or stickers. 2. Cut 6in x 12 in strip of FabScraps Wild At Heart Wild Ride 2 paper C59006 for the base of the card. Fold in the middle. You can have this card open any way you wish. 3. Cut a 4.5in x 4.5in square of Wild Ride 2 paper to use as the front of the card. Use the flipside from that used for the base of the card. 4. Cut a 1in x4.5 in strip of black cardstock and rip the edge. Glue to the top of the 4.5 square. 5. Cut a 6in x6in piece of Wild At Heart –Wild Tunes 2 C59008 and rip the edges to give a carefree appearance. This will become a frame for the 4.5 square. 6. Glue to the base of the card. 7. Rip a small piece of Wild Tunes 2 paper and glue to the top of the square. 9. Take a small piece of bubble wrap and paint the bubbles with gesso or white acrylic paint. Glue to the bottom of the card. 10. Cut 24 inches or string, twine and wrap around the bottom of the card where the bubble wrap is. I punched a hole near the edge of the card to stagger my twine. Tie the twine in the front. 11. Attach safety pins/ trinket pins to the twine. 12. Glue a 2in piece of trim over the twine in the spot where you plan on placing the chipboard. 13. Glue a 1in piece of trim to the top right corner of card. 14. Add some decorative pearls to the top right corner under the trim. This just adds more texture as an accent. 16. Coat the Wild At Heart chipboard piece DC59008 with embossing ink. Cover with embossing powered and heat set with heat gun. 17. Rip a small piece of Wild Tunes 2 paper and glue to the back of the chipboard piece as a “splash” of color accent to make the chipboard pop. 18. 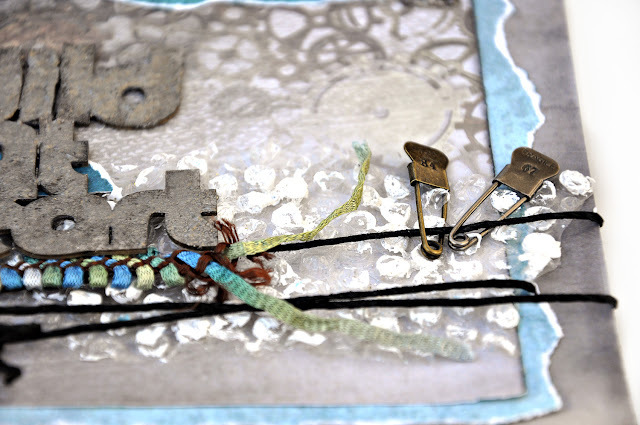 Glue to card near the trim and twine section of the card.